Some things in life are just made perfect, like this precious gold ensemble currently on display at the Victoria & Albert Museum. Yes, Wednesday of this week was delightful, for I got to see this very piece along with approximately 85 others, being showcased in the capital until 16 February. Actually delightful isn’t the right word, remarkable feels better, for there’s something for everyone. Perhaps your thing’s denim – embellished denim; or you have a preference for loud chunky knitwear; even partial to wearing a slogan T-shirt. The range and diversity in the show is squeally good. So, the display is over two floors and I was having an entertaining time downstairs, admiring the ladies evening wear with dangerously low cut back sections, singing along with ‘Your My Obsession’ and thinking to myself – ‘Well this is good and thankfully Joseph designs are different these days’, when I reached and climbed the stairs – and came face to face with my eleven to fifteen year old idea of HEAVEN. Yes truly, I was eleven in 1983 and thought Culture Club were the most on-trend, fantastically gifted group, and though Adam Ant was more my sister’s fancy, the pirate outfits of that era can’t be challenged, rather should be championed…and some of those treasures were two feet in front my glazed over eyes. 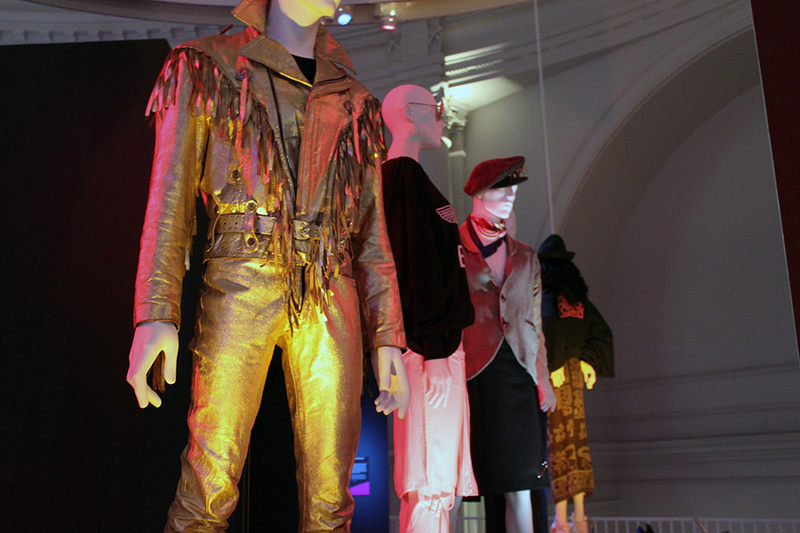 Added to the spectacle – there were leather-studded Terence Trent Derby look outfits standing just metres from ‘High Camp’ and ‘New Romantic’ examples of sensational wearable design. And added to the perfectness of it all, an area dedicated to film and photographs shot in the most popular nightclubs of the time; at catwalk shows and parties. Sadly, I had to leave my eleven to fifteen year old idea of Heaven and never lived (or would have been admitted to a nightclub) in London during the high voltage make-up days of the 1980s. Happily however, I’m inspired to make some exciting changes with regards to my wardrobe choices. I can see that tame is not where I need to be and a little adventurousness in fashion can be a great thing.